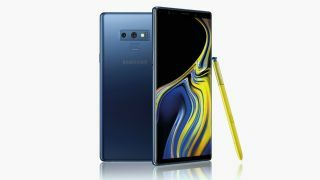 Not even six months after Samsung launched its S9 and S9+ models, the company has unveiled the Galaxy Note 9. The new model maintains the S9's dual-camera setup on the rear, with 12MP sensors and the ability to switch between f/1.5 and 2.4 apertures to suit the ambient lighting conditions, together with Optical Image Stabilisation to help keep things crisp. 4K video recording, together with super-slow-motion HD video to a maximum 960fps is also possible. Around the front, meanwhile, there's an 8MP camera for selfies, while the same AR Emoji technology we've seen before is on hand for when you want to have a little fun. Perhaps the device's most interesting feature is the AI-powered Flaw Detection, which aims to let you know if images aren't quite as good as they could be. If the image is out of focus, or if the device detects that a subject in the frame has blinked at the moment of capture, it will notify you of this. In addition, it also claims to be able to tell you if the lighting is bad – such as when shooting against backlighting – and even if you have a smudge on the lens that may be compromising image quality. While it stands to be a useful addition for many who may be shooting casual snaps, it can be disabled if the user desires this. Auto Scene Optimization is also in hand, and this works on the same principle as scene recognition modes on other smartphones and cameras, first identifying subjects before deciding on a category and adjusting parameters such as contrast, brightness and saturation to suit. Other features include a 6.4in Infinity Display, up to 8GB of RAM and up to 512GB of storage space (which can be expanded through the MicroSDXC slot if this isn't quite enough), as well as a new Bluetooth S Pen that can be used to trigger the phone's camera when shooting from a distance, such as for group shots. Samsung has faced intense competition recent years, both from big names such as Huawei and longstanding rival Apple, and a raft of budget smartphone manufacturers. While the company retains the top spot among smartphone manufacturers for sales, it was reported earlier this month that Huawei had overtaken the Apple to be the company's biggest rival, despite its models not being available in the US.